Making electronic components smaller and smaller has already revolutionized consumer electronics, communications and computing. In 1970, semiconductor processing technology made it possible to assemble about 4,000 transistors on a silicon chip. Today, it is possible to get 100,000,000 features on that same size chip due to the industry’s increasing ability to fabricate smaller and smaller feature sizes on silicon by “top-down” processing technologies. However, engineers are reaching the limits of these manufacturing technologies, and if we are going to maintain this communication revolution, it will be new “bottom-up” technologies that sustain the continued miniaturization. Today, researchers are showing that single molecules properly configured can function as a transistor. They have learned to fashion nanotubes and nanowires from strings of molecules and atoms and to manipulate these into configurations where they can be used to store and/or process information. Nevertheless, these new nanotechnology techniques bring both new challenges and new opportunities. 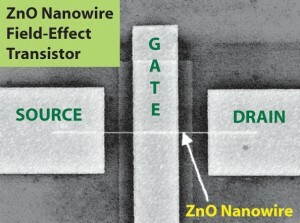 It will be a technological challenge to make and interconnect features with nano-dimensions to form computer chips, but the computer logic of a circuit made with q-bits will obey quantum mechanical laws and function differently. We can exploit this new logic to make new kinds of computers; and by utilizing the spin of individual electrons as logic signals instead of the current flow of many electrons, the tremendous heat generation problem of present-day transistors can be reduced. Memory storage devices will certainly benefit from smaller feature sizes. By harnessing the nanoscale layers and dots of memory bits that researchers can now fashion, the information on thousands of CDs could fit into a memory the size of a quarter. It is likely that electronics will be among the first big beneficiaries of N S & T.
Semiconductor engineers are also learning from their life science colleagues that biological molecules can be functionalized to serve as a template for arranging nanoscale circuit components in a regular fashion. DNA is a well known organic molecule that is both versatile and stable and has already been used to help fashion logic devices, chemical and biological sensors, and molecular transistors of nanoscale proportions. Even viruses have gotten into the act. In one application, researchers utilized viruses and their proteins, doped with selected metals and wrapped around a single strand of DNA, to template wires and thin film structures used in Lithium battery electrodes. Rechargeable Lithium ion batteries are used in a wide range of portable electronics from laptop computers to cameras and are often the weak link because of their size, capacity, and limited lifetime after charging. This new nanoscale templating approach could result in better flexible thin film batteries and should be applicable to other electronic devices like solar cells and capacitors. 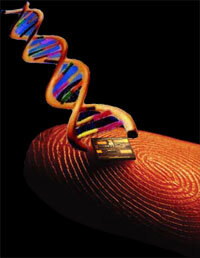 Working together, engineers and biologists are on the threshold of fashioning integrated circuits from the “bottom-up”.